Here’s a simple tweak that makes a lot of sense. You have an event that either isn’t taking registration or you want people to email you for inquiries instead of registering on the site. With the Multi Event Registration add-on active, you will see an Add to Cart link regardless of whether you are displaying a registration form. As discussed in another document, this is handy if you want to use the Multi Event checkout instead of the regular registration form. 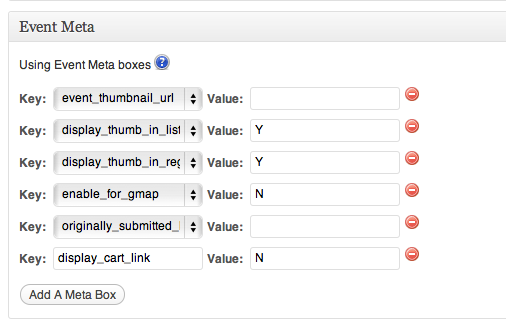 However, by default, you’ll still get the Add to Cart link in your Event List. In this tutorial, I’ll show you two ways to hide the Add to Cart link for different uses. In both methods, we’ll be editing the event_list_display.php. You’ll want to refer to Where do I put these custom templates I just made and Customizing your upcoming events widget using CSS and template files if you have any questions about how to edit the template files or what to do with them once you’ve modified them. First we need to create our meta key and value pair. This is done in the event. We can call the meta key whatever we want, so I’ll do something obvious like ‘display_cart_link’. Now we have our meta key and we can use this on any event. 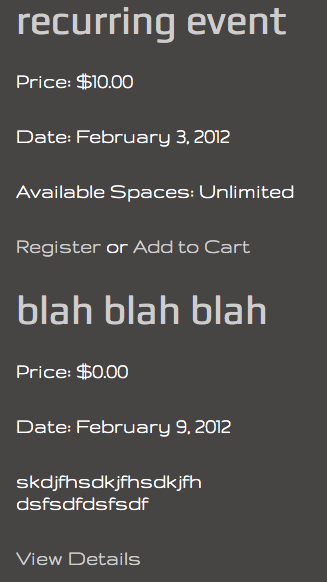 For this event, I don’t want to display the cart link, so my value is going to be ‘N’. Easy enough. Now let’s add that to the event_list_display.php.